For Essie Martin ’21, modeling a dress made from trash at the 13th annual Trashion Show was a win-win proposition. “It’s fun, and it raises awareness about waste,” she says. Martin’s outfit was made from discarded plastic and accessorized with plastic straws once sipped by Bates students and by customers of Dunkin’ Donuts and Starbucks. “We collected the straws from trash bins for months,” she says. Photographs of the 2018 Trashion Show by Theophil Syslo. The annual Trashion Show is produced by the student EcoReps and, like the prior 12 editions, this year’s was a “night of fun and ridiculousness and lovely outfits,” says Tom Twist, the college’s sustainability manager. One of those EcoReps is Liv McCulloch ’21, an economics major from Sunderland, Mass. “Last year I just watched the show. This year, I wanted to get involved, and get my friends involved,” she says. 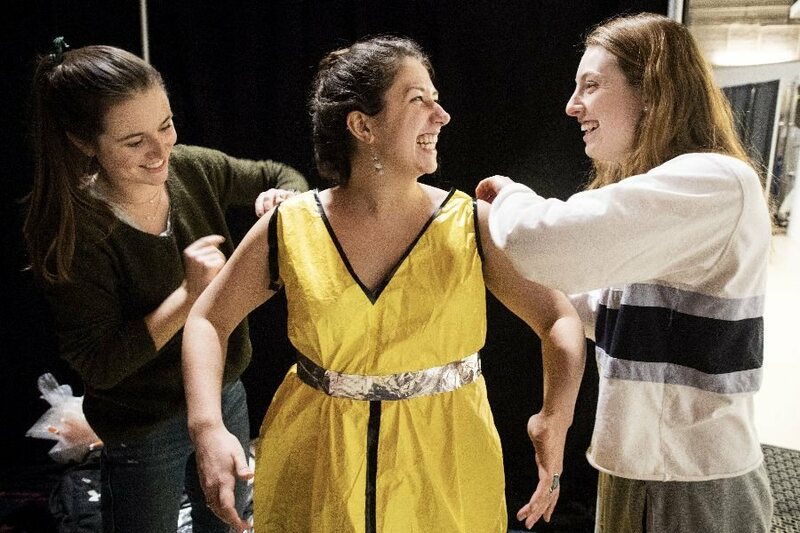 So McCulloch teamed up with Sophia Ball ’21, a psychology major from New Hope, Pa., to design a Wizard of Oz-themed outfit made from discarded Halloween costumes modeled by Cassidy Martin ’19, a European studies major from Wilmington, Del. For designer Michael Somkuti ’19, a mathematics major from Ambler, Pa., an interest in pro video gaming, or eSports, inspired his outfit. Professional gaming “has been exploding in scale and viewership,” he says, pointing to a recent League of Legends World Championship event in South Korea that drew an audience of 17,000, who rocked the venue with inflatable noise makers throughout the competition. Somkuti used similar sticks to make “a kind of jumpsuit” that was modeled by T.J. Emmerman ’21, a prospective politics major from New York City.